I’m a Plotster (a plotter + panster) and a writer with big ideas — big ideas that involve multiple moving parts with numerous plots, main and sub. In my current WIP, I have a central plot, a secondary through which the main plot unravels and six subplots. With eight plots playing out over the course of the novel, I struggled with a way to keep everything organized. Prevent significant plot holes, and track the developments of my story. Then I came across an image of J.K. Rowling’s outline done by hand in a grid format. It had everything I needed. I adopted the same principle into a spreadsheet, applying, too, my preferred plot structure the 3 Act Structure. This spreadsheet outline is what I refer to as my Macro Outline. In my early revisions when I need to cement all the finer points in my plot, I also use a Micro Outline for scene-by-scene breakdowns. 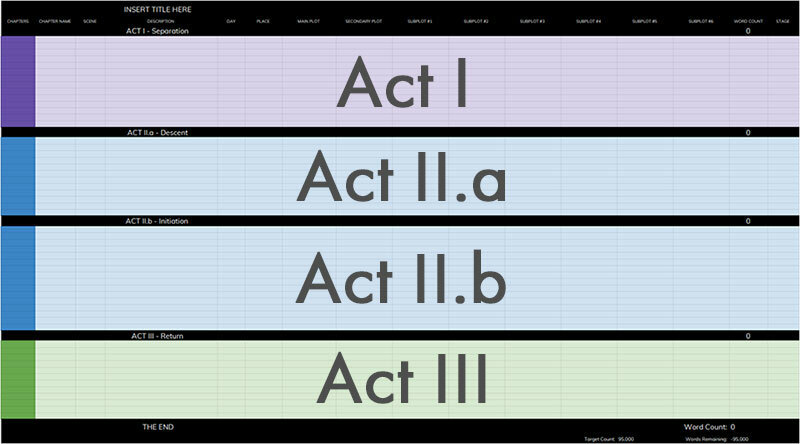 I color coded my Acts for easy at a glance reference. Plus, pretty colors lend to my creative process. My first act is purple, second act (split in two for Pre and Post Midpoint) is in blue and my third act in green. Writer tip: Alternate the colors of your rows. Changing up the colors creates a higher degree of separation between your chapters. 1. Chapter Number: Here I also note the beats I have to hit in each Act. Learn the beats for your chosen structure and note them as you insert the respective scenes/chapters. 2. Chapter Name: This is optional. I’ve always had a hard time finding specific names for my chapters and shied away from it for that reason. This time, however, I decided to embrace the challenge. 3. Scene: I break down my stories by scenes and group them into chapters. 4. Description: Insert a short note on what happens in each scene. 5. Day: I track the length of time each scene covers. Knowing how long a particular plot event takes also helps me to set the pacing. A quest that covers a single day will move faster than one spread over several days. 6. Place: The setting of each chapter/scene. With fantasy novels and others like it, you’ll have multiple scene changes. It’s always good to keep track of these. 7. Main Plot: The overarching plot that ties the entire series together and the main plot of Book 1. Your main plot should play out in every chapter one way or the other. Each chapter should include some development in your protagonist. Note these turning points so you can track them while you write. 8. Secondary Plot: I use a secondary plot line as the companion that aids the unraveling of the main plot. In my WIP my Protagonist needs to figure out what she is and she does so when she goes (unwillingly) on a mission with a team of strangers. The two plots (primary and secondary) are intricately tied, but the Protagonist doesn’t know this at the start. She discovers the link over time as the two converge during the course of Book 1 until they merge in the end. I found structuring my story like this worked best as it's told in first person POV. The secondary plot, though connected with the main plot, does get a conclusion. 9 - 14. Subplots: In total, I have six subplots, all of which get a conclusion at the end of Book 1. I do have the habit of making my plot too complicated and tangled. The story gets clunky, nothing gets the proper time it deserves, and it all goes to hell. What I’ve done to keep things simple is give my subplots a singular purpose even if they’ll reappear again in another book. An example: My Protagonist possesses a valuable artifact, but for Book 1 the purpose of the subplot is to educate my Protagonist about its importance and have her use it in achieving her goal. I don’t delve into the ‘why’ it’s important until Book 2. You can have a story with unexpected twists without the complexity. It’s a matter of focus and planting the right seeds in the right place. 15. Word Count: My outline also tracks my word count. 16. Stage: This shows where I am in my drafting/revision/editing phase. Shuffle scenes around for better flow: With all the moving parts laid out I can review the trajectory of the plot and decide if a scene should happen sooner or later or even none at all. Track the progress of all my plots: As I mentioned before, getting my plots tangled was an issue. I’d focus too much on subplots that suffocated my main plot, or I’d start a storyline and forget all about it. Track which subplot or chapter doesn’t advance the main plot and cut it: We all have our darlings, most of which serve no other purpose than to stroke our writer’s ego. Cut them without prejudice. Though the Macro Outline is my main tool, it’s not where my plotting beginnings. I start my outlining process by writing out all my initial ideas in a notebook. Random jottings of scenes I'd like to include. Even though I won't incorporate all of them, I note everything regardless. Once I've recorded all my current ideas I move on to break them down in beats. Method #2: Where I outline my beats in Trello. The horizontal layout is a digital replacement for my whiteboard. I can make all the changes I want and limit my wasting of paper. I start with my beats first because it gives me a better idea of 1. the key points I'm missing and 2. the flow of the story. Once I've sorted out my beats I start plugging them into my spreadsheet where I add in the connecting scenes. As a guidepost, I write my beats on index cards and keep them on the board over my writing area where I can see them each time I sit to write. There is something to be said about ‘subconscious processing.’ A lot of my breakthroughs come from feeding my brain with information and allowing it to process in the background. Whether you are a Plotter or a Panster, having an outline (no matter how complex or basic) will help you in organizing your plots. Find the method that works best for you. An outline is only “limiting” if you allow it to be. Have any questions or feedback? Don’t be shy. Let's chat in the comments below. Until next time friends, #KeepWriting. 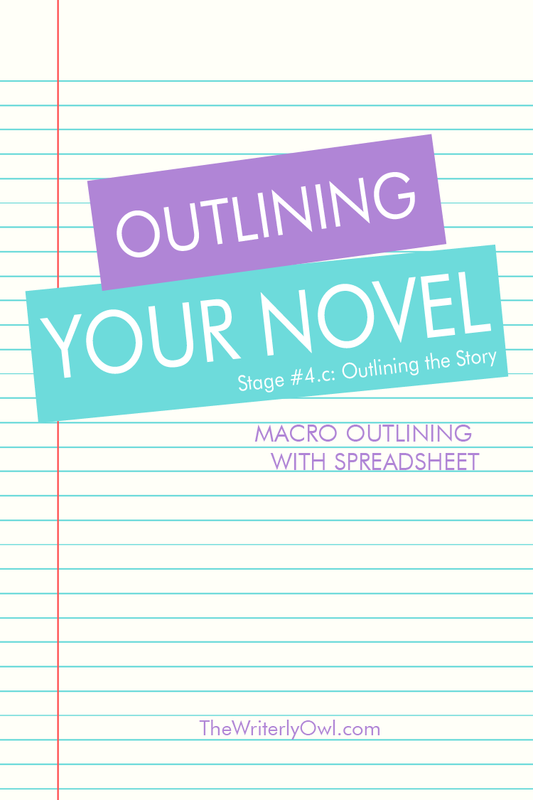 Interested in trying out my Marco Outline? Head over to the Owl Lounge. If you’ve already signed up for my newsletter, enter the Owl Code at the bottom of your welcome email. If you haven’t signed up yet, sign up for access.